A riding lawnmower is a mower which the driver can sit on top of. These mowers are best for those with large properties. However, if you have a hilly property there are additional features you may want to consider. 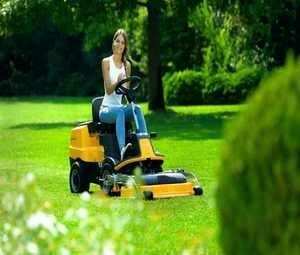 When choosing the best riding lawn mower for your hilly property, there are many options. However, if you make the wrong choice, your grass won’t be cut evenly, and you’ll end up having to replace the unit (Source). The key features to look for in a riding lawn mower are their degree rating, the deck size, and the motor power. Make sure you take the time to truly know your mower and your property before you jump into a purchase. Read our reviews of the top five riding lawn mowers for hills here. 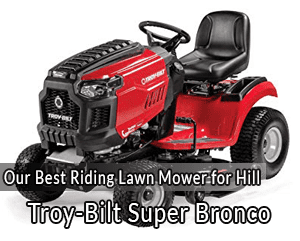 The Troy-Bilt Super Bronco Riding Lawn Mower has a 42 Inch Deck incredibly strong engine. This should mean that you will be able to mow steeper areas for a longer amount of time and not have to be concerned about being in danger. The 42-inch deck, with an optional 50-inch deck, allows you to mow an incredibly wide path. The largest advantage here is that you will be covering more land in a shorter amount of time. In addition, the engine strength allows you to mow incredibly rough areas. One benefit of this is that you will be able to mow thick, heavy grass. A second benefit is that you will be able to handle steep hills with ease. The fuel tank on this lawn mower is a full 3 gallons. This means you should only have to refuel every 6 acres or more. A final feature of the Troy-Bilt Super Bronco is the seat. The seat has a high back with perfect cushioning. It also has quite a bit of extra leg room, providing comfort for riders of all sizes. Another mower by Troy-Bilt tops our list of the best riding lawn mower for mowing hills. This mower has several different features, the primary one being that it is not quite as strong as the Super Bronco. Like the Bronco, however, this mower has a 42-inch mowing deck. Again, this means that you can mow very wide strips of your land at once. The engine power is not quite as strong as the Super Bronco. If you are planning on mowing incredibly steep hills, the Super Bronco should certainly be your first choice. However, the 420ccs this engine provides will allow you to mow many steep hills. Additionally, the transmission is continuously variable. A continuously variable transmission means you can switch between all 7 speeds without too much of a pause or hesitation in the mower’s abilities. The maximum speed is 5.2 miles per hour. This mower only has a 1.36-gallon fuel tank. This means you will probably only be able to mow 3 or so acres before fueling up. Take this into consideration if you have a larger property. An advantage to choosing this mower is the warranty. Though it is a limited warranty, the mower is covered for any manufacturing defects for at least two years. Finally, the seating is not nearly as comfortable. The back of the seat only reaches mid-back and there is not as much leg room. 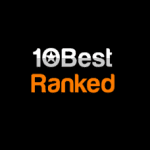 Husqvarna is one of the top rated lawn mower manufacturers. This particular model has 18.5 horsepower behind it, making it an incredible lawn mower for hills. To begin with, the deck on this lawn mower is only 38 inches, making it significantly smaller than either of the Troy-Bilt lawn mowers. While this means it may take a bit longer to mow a large property, keep in mind that the mower still has a very wide deck. Though the deck is small, the engine is great. This lawn mower meets the Super Bronco at 540 ccs or 18.5 HP. Once again, you are met with an incredible continuous variable transmission, allowing you to switch between speeds. Remember, this means it should feel just like driving a car. The seat on this is also mid-back, but it is vinyl and has springs to cushion any bounce. This should allow for extra comfort and less resistance on hills. A second Husqvarna makes it on the list of the top five riding lawn mowers for hills. This Husqvarna packs an extra punch when compared with the others on the list, but falls short in several categories. Like the Super Bronco, this mower has a deck of 42 inches. However, it does not have the option of a 50-inch deck, making it a touch behind. The Husqvarna Z242F has an engine with power to surpass all others. With a horsepower of 23 (or 747 ccs), this mower can handle any incline or land texture. This mower has a hydrostatic transmission. Remember, a hydrostatic transmission means that instead of a belt, the liquid is rotating the engine. This is easily one of the smoothest rides provided by any transmission. Once again, this is a lawn mower which has a smooth ride, providing you immense comfort while you ride. Speaking of comfort, the seat is approximately 18 inches in height. Ultimately, this will cover your entire back, providing you ultimate support. As far as a warranty goes, this mower has a solid 3-year limited warranty. While this is no lifetime warranty, it still is better than many of the mowers on this list. The last mower on this list is not nearly as powerful as others. Coming in at only 679 ccs, the engine power certainly may leave you wanting. However, the deck on the Cub Cadet is a solid 50 inches. This allows you to cover a large amount of land very quickly. Just like the Z242F, the transmission on the XT2 is a hydrostatic transmission. This means very smooth transitioning between speeds and no manual shifting. Once again, hydrostatic transmission is a transmission where liquid rotates the engine, not belts. This is easily one of the smoothest rides provided by any transmission. The seat on the Cub Cadet XT2 is incredible. Another high backed chair with extra cushioning provides you with very little bounce as you maneuver hills. The warranty is, perhaps, what sets this mower aside. To begin with, you will have a 3-year unlimited hours warranty, as well as a 5-year warranty on the chassis and front axle. This does not finish it off, though, a lifetime warranty on the deck shell is the final piece of this machine’s warranty. Remember, purchasing a riding lawn mower for hills means that you primarily want high horsepower and a wide deck. These two features give your mower strength and stability. When you know what you need in regards to horsepower and deck width, there are many other features to consider. Make sure to read our reviews thoroughly before making your pick. Zero turn lawn mowers make hill mowing incredibly easy and possibly more enjoyable. Standard lawn mowers have a braking mechanism which allows you to change the speed as you drive. Zero turn lawn mowers only have an emergency brake. This means that you cannot slow down when you turn, making for quick turning and faster mowing. Typically a zero turn lawn mower can operate at almost double the speed of a standard mower. This only allows you to finish your lawns faster. Additionally, these mowers can turn 180 degrees. This rotation lets you end your rows without having to go back and fix any gaps. It also gives your lawn a much cleaner look. Horsepower is one of the most important decisions when purchasing a riding lawn mower for hills. The horsepower determines the amount of power the engine has, and thus how many hills it can handle. The range of horsepower on our list of the best lawn mowers for hills is 13-23 HP. Though the higher the number, the more horsepower the mower has, not all mowers must have the highest horsepower. If you own a property with low, rolling hills, a horsepower of 13 will be fine for your situation. However, if you have regularly steep inclines, the 23 HP lawn mower is the perfect choice for you. Fuel source is another option to be aware of. However, the fuel options are not nearly as important as the horsepower option. Primarily, fuel sources for lawn mowers will be either gas or diesel. Make sure you check which fuel your mower choice uses before purchase. 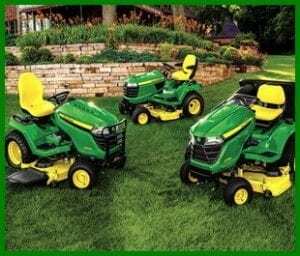 Many lawn mower companies offer similar lawn mowers with each fuel choice. If you find one that you like which uses the alternative fuel, do not be afraid to call and ask the company. In some special situations, the special make the mowers with the opposite fuel source. The speed options for lawn mowers have come a long way from the old manual shift. While this is still a feature, most homeowners who own expansive properties do not want to be distracted by a manual shift. The first option for speed is the CVT. This stands for the continuous variable transmission. A CVT operates very similarly to regular automobiles. However, in your automatic vehicle, you will often feel the vehicle shift. Not so with the CVT, as there are no gears, only one continuous gear. The hydrostatic transmission is the other on this list. For those who do not want to have to worry about transmission belts giving out, hydrostatic is the best option. Instead of dealing with belts to run the transmission, the transmission is controlled by the fluid. This leads to significantly less upkeep and a much smoother ride overall. Another option to check out is the deck height. Most lawn mowers have multiple deck height options. The standard heights are 1”-4”, allowing the driver to decide how short or long the grass should be. One thing to watch with the deck height options is how the deck is raised or lowered. Some lawn mowers have an electronic feature to raise and lower the deck. Other lawn mowers the driver must manually lift. Depending on how many obstacles are on your property, you may not want to be responsible for manually changing the height of your deck. Be aware of this as you purchase your mower. The seats of lawn mowers are another incredibly important detail. If you are not comfortable with your riding power, why would you purchase it? Remember, you will be spending a significant amount of time each week on your mower. The mid-back seats are much less desirable, as they strike in the middle of the back and thus do not offer as much support. If your property is small, under an acre, this seat height should not be an option for you. These seats should also not be an option for you if you are incredibly tall. When a seat strikes you mid-back, it can cause posture issues and spine issues later on. These high-backed seats are by far the best mower seats on the market. They provide support to the entire spine. We recommended for those who are spending more than 2 hours each week mowing. These seats ensure your safety and comfort while mowing. Warranties are tricky but important, to understand. The types of warranties listed in our reviews of the top 5 riding lawn mowers for hills are limited, unlimited hours, and lifetime. A limited warranty often means that the company will only replace parts which have manufacturing defects. On occasion, a limited warranty is one which is active for a limited period of time. Another warranty option is an unlimited hours warranty. 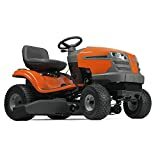 This is a warranty which is set for a specific period of time, such as 5 years, and does not change based on how many hours you drive the mower during that time. f you are driving the mower for lengthy periods each week, this is a great option for you. This is a particularly great option for those who own a mowing company. The final warranty is a lifetime warranty. This means that for the lifetime of the mower, the specific part of the power mentioned will be covered. This is the best warranty option for anyone who plans on driving their mowers into the ground. As you are still considering which lawn mower to buy, remember a few key options which will make or break your hill mowing experience. First, remember that the horsepower or ccs are incredibly important. A warranty is an additional feature to consider. There are many types of warranties, and only some are beneficial for you. Make sure you read through our warranty section before you make a final decision. Share your experience with a riding lawn mower on hills below! We would love to hear about your favorite!